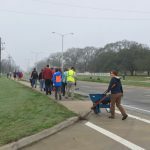 What causes 35 gloved people carrying shovels to appear in the median of Pont des Mouton on a Saturday morning in February? 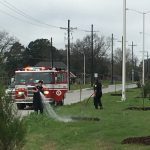 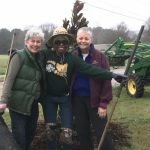 It’s TreesAcadiana doing their 15th annual Arbor Day planting. 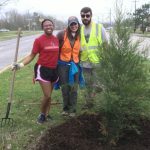 Arbor Day dates to the time of Columbus and to Spain where people first the honored the importance of trees to their existence. 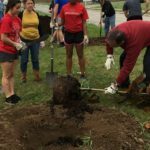 Like any great idea, the world quickly followed the Spanish lead with days celebrating the planting of trees springing up across the globe. 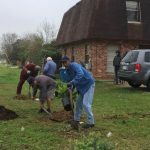 TreesAcadiana encourages planting of native varieties like swamp magnolia, tulip poplar, red cedar and that will thrive in our environment with minimal further care. 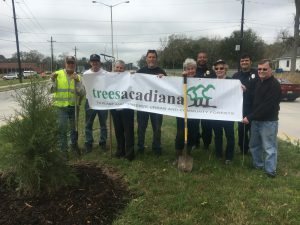 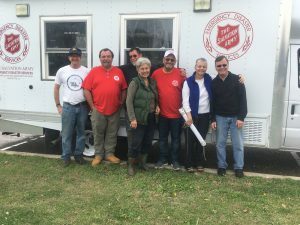 Tree planters included apartment residents who planted bottlebrush bushes as a screen for their area, ULL students, Lafayette Consolidated Government, Scenic Lafayette, Acadian Native Plant Project, a mother/daughter team and assorted TreesAcadiana members.